Why Buy Visio 2010 Pro? When presenting data and graphics in your presentations and projects, the lack of adequate diagramming tools can sting hard at times. A need is often felt for a more dynamic and versatile programme or tool that can be used in conjunction with existing tools, to produce a creative and satisfying result. With the launch of the Microsoft Visio diagramming and vector graphic application, much of this need has been duly fulfilled for many users. This tool has been crafted with newer and more sophisticated elements that make communication in a visual format, simpler, easier and more comprehensive. With this tool, a user can now create custom diagrams and effective flowcharts. With its targeted elements, Microsoft Visio aims to make communication of complex and haphazard data, in a much simpler and condensed format. Updated user interface One of the most useful and ergonomic feature that has been brought out with Microsoft Visio 2010 is the Office fluent interface, which includes a ribbon that contains some of the most frequently used commands on it. Moreover, the shapes window has also undergone a change, displaying currently open stencils in the document. There are additional shapes that can be used in the document now. Two stencils can now be opened at once. You can also put frequently used shapes at the top. Design and formatting features A new Live preview option now displays how various themes and fonts will appear before they are applied, by using a simple pointing mechanism. A new auto size option has also been introduced. It becomes easier to create larger diagrams with this tool and a separate dotted line feature, indicates division of printed pages. New auto align and space options also let you adjust the alignment and the spacing of shapes, whether you wish to do it all at once or select specific shapes that you wish to adjust. New guides in the Visio now help the user in even lining of shapes and position everything correctly. File formats Microsoft Visio 2010 uses VSD and VDX file formats, to read and write drawings. These well documented drawing and XML drawing formats, made use of the schema based formats for an ergonomic use. Versions available The Microsoft Visio 2010 is available in three formats, viz, Standard, Professional and Premium. Why use the new Microsoft Visio 2010 Professional? The Microsoft Visio 2010 Professional is much more than a solution to complex and dynamic visual constraints. The intuitive interface of this new tool is what you need to bring your diagrams and visuals to life. This tool makes your tasks simpler and exemplifies your performance and efficiency. With the innovative designs and tools added to the Visio, you couldn’t ask for more simplicity while diagramming. Instant diagramming support with a variety of pre drawn shapes and themes, all related to business, management and IT. Choose the most appropriate designs and shapes from among vast variety of options available. New and advanced templates help in designing processes and work flows easily. Locate the features that you need, more quickly. Presentation and management of tools becomes easier and more manageable with the Microsoft Visio 2010 Professional. With many more advanced features introduced in this version, you can easily locate and pin your most commonly used tools right at the top. Automatic drawing features and modifying tools further enhance the aligning and shaping processes. With many new toolbars to manage, graphics never spoke more clearly. Relate your diagrams and processes in a logical and sequential manner easily, to depict the essence of a large text, in the form of a diagram. With new relation diagrams, it gets easier to achieve this task. 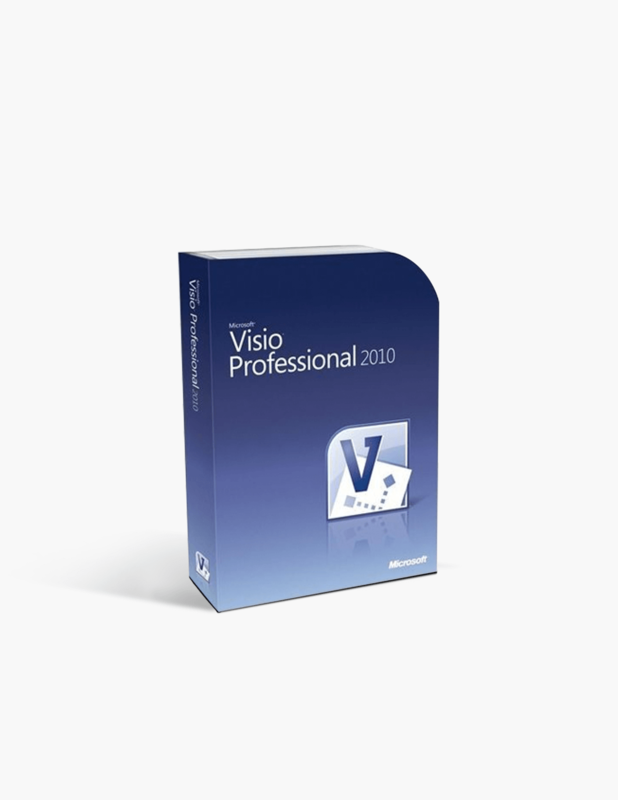 The Microsoft Visio 2010 Professional allows making more professional and aesthetic results in a less amount of time. User can create actionable and visual mash ups that combine the rich resources of the tool to create real time data and present that in an appealing stance. Data linked diagrams can be shared quite easily with other users as well through a browser and an account. Products at a reasonable price and easy to download and install. Hesitant to purchase software online, as have been burned once before.. Pay and to receive an e-mail with instructions to obtain the software. E-mail did not show up for a week, did not work and no one would respond. So, looking for Visio & Project, found Softwarekeep, who had both packages for good prices. Took the leap. ordered and as promised, 15 minutes later, two e-mails, with links that worked and downloaded my software. In less than 30 minutes, had both software packages up and running.. Definitely will do business with Softwarekeep. Quick, efficient purchase and download. Had an issue with the automated email; called and they responded immediately. No further issues, good experience. The SoftwareKeep website was easy to navigate which made the purchase experience very easy. $74.99 | In Stock Want it Now? Order and receive your download instantly.